Some experts fear that methamphetamine could be the next epidemic. CLEVELAND — Some experts fear that methamphetamine could be the next epidemic. 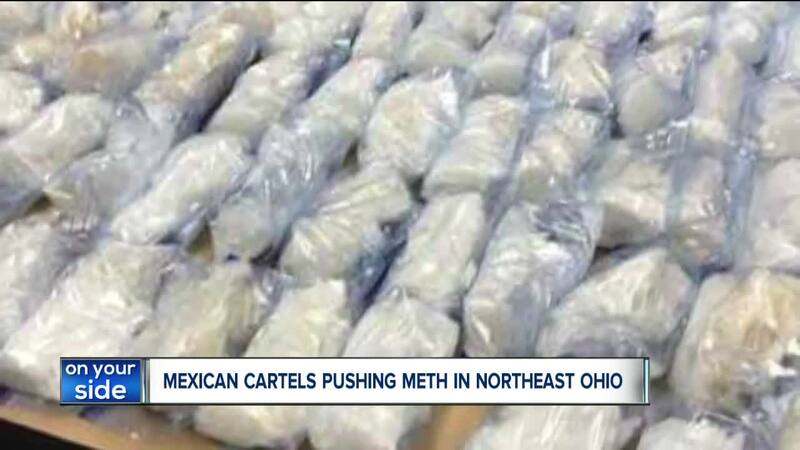 The drug is coming into Northeast Ohio from Mexico, according to Assistant Special Agent in Charge of the DEA in Cleveland Keith Martin. “It’s 100 percent being pushed by the Mexican cartels,” said Martin. The most recent statistics from the Drug Enforcement Agency showed seizures of methamphetamine at the Mexican border in 2010 was at 8,900 pounds, last year it was 82,000 pounds. Still with those seizures, DEA agents in Cleveland seized the largest amount of the drug ever in the state’s history. “We seized 142 pounds of meth which is a big seizure for this area. It’s a border type seizure,” said Martin. The Ohio Highway Patrol has seen a similar increase in meth seizures since 2010. “Meth is a horrible drug,” said Cleveland Clinic Doctor Baruch Fertel. “I would say it has not reached epidemic proportions ye. But, we are seeing patients using meth,” said Fertel. Fifteen years ago, law enforcement across the country were seizing about 15,000 meth labs a year, now that number is down to about a thousand, Martin said. “People aren’t willing to take the risk of making it, it’s cheaper to buy it,” said Martin.